Sword is called Jian in Mandarin. It has different meanings from the western word because Jian means the double-edged swords. The single-edged is called Dao in Chinese. Dao is listed as the first kind of the 18 kinds of ancient Chinese weapons, and the Jian second. Swords have a long history in China. They were used as early as the Shang period (1500BC) when bronze technology developed. The history of the sword is also a history of Chinese technology. Longquan is one of the places that produced great ancient swords in the early days of China. Jian have been loved by Chinese martial artists and Kung Fu practitioners since the very beginning, and various styles of swordsmanship have evolved, such as Wudang Jian (Wudang Sword), Emei Jian (Emei Sword), Zui Jian (Drunken Sword) and Tai Ji Jian (Tai Chi Sword). When the swordsmanship is revealed by the masters, it's stunningly beautiful. Maybe this is one of the reasons why swords have captured the imaginations of Chinese people. 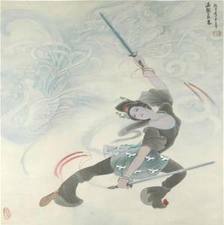 Swords have appeared in Chinese various arts, including calligraphy, dance, poems, novels, music, songs, movies, TV programs, and of course, martial arts. Jinyong's novels have so far best demonstrated how amazing the world that created by Chinese swords can be. 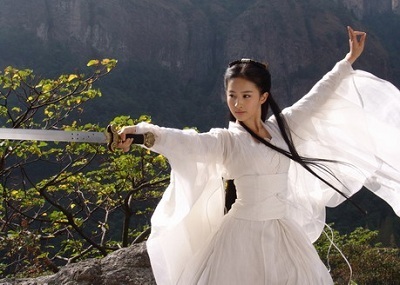 The first recorded time when swords entered into the art of dance was in the Tang Dynasty. A beautiful dancer called Gongsun integrated swordsmanship into her dance and was an immediate hit when she performed on the street. She was asked to perform in the imperial court and was dazzlingly successful. Poet Dufu wrote about Gongsun and Gongsun thus entered into Chinese literature history. The character in this picture at the left is "sword". It was rendered with its meaning by writing the last vertical stroke like a sword.